SACRAMENTO, California, February 10, 2012 (ENS) – California Governor Jerry Brown and U.S. Transportation Secretary Ray LaHood Thursday reaffirmed their strong support for building high-speed rail in California over the objection of House Republicans, who want to starve the project of federal funding. Secretary LaHood has been traveling around the state this week to discuss the project with state and local officials as well as stakeholders. 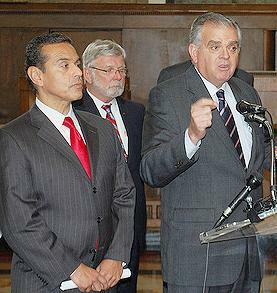 “Over the past week, I have traveled all over the Golden State and have found a strong base of support for the California high-speed rail project, from workers who will build it, manufacturers that will supply the trains to run on it and businesses that will benefit from using it,” said LaHood, the only Republican in the Cabinet of President Barack Obama. The California High-Speed Rail Authority is developing a Sacramento to San Diego electrically-powered high-speed rail system that will operate at speeds of up to 220 miles per hour. The full 800-mile-long system will connect all of the state’s major urban centers. In 2008, the Board of the California High-Speed Rail Authority adopted a renewable energy-zero emissions strategy for the high-speed train project. The high-speed train system is expected to use 3,380 gigawatt hours a year of energy to transport 94 million passengers by 2030. Researchers reporting to the Authority said generating this amount of energy from renewable sources is “well within the capabilities of the state.” This amount represents one percent of the state’s electrical load, or about three and a half days worth of electricity consumed in California. Initial infrastructure construction will begin this year in the Central Valley, the backbone of the system. The project is expected to generate 100,000 construction job-years of employment over the next five years and nearly one million economy-wide job-years over the life of the project. The project is being funded through voter-approved state bonds, federal funding grants, local funding, and public-private partnerships. 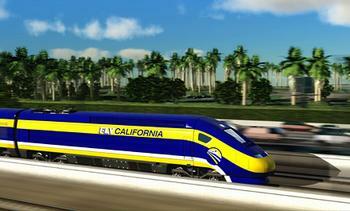 But Congressional opponents of California’s high-speed rail project are working to ensure that a new highway bill does not provide more federal funding for the project. The House Transportation and Infrastructure Committee approved legislation earlier this month that would authorize road, bridge and other transportation projects. An amendment to the American Energy and Infrastructure Jobs Act (H.R.7) from Congressman Jeff Denham, a California Republican, prevents any of the money from being used on the state’s high-speed rail system. California’s High-Speed Rail Authority pegs the most current estimated cost to build the 800-mile system at about $45 billion. Once built, the system will not require operating subsidies and will generate over $1 billion in annual profits. The state agency says the estimated $82 billion, in 2003 dollars, needed to expand highways and airports to meet a similar demand expected to be carried by the high-speed train system is “a very conservative figure.” The analysis behind this conclusion was part of the Authority’s certified Statewide Program environmental impact statement, and was extensively peer reviewed by other agencies, organizations, and the public.